Department of Information Science is hosting a chat with Leonid Volkov on Internet in Russia. Leonid Volkov is campaign manager for Russian opposition leader Alexei Navalny. Currently, Leonid oversees all regional political operations of the Russia’s Future Party. Together with Fyodor Krasheninnikov he published three editions of “The Cloud Democracy”, a book on how modern technology could re-shape and re-define democracy and elections. Leonid is also founder of the Internet Protection Society, a NGO focused on internet freedom and digital rights in Russia. 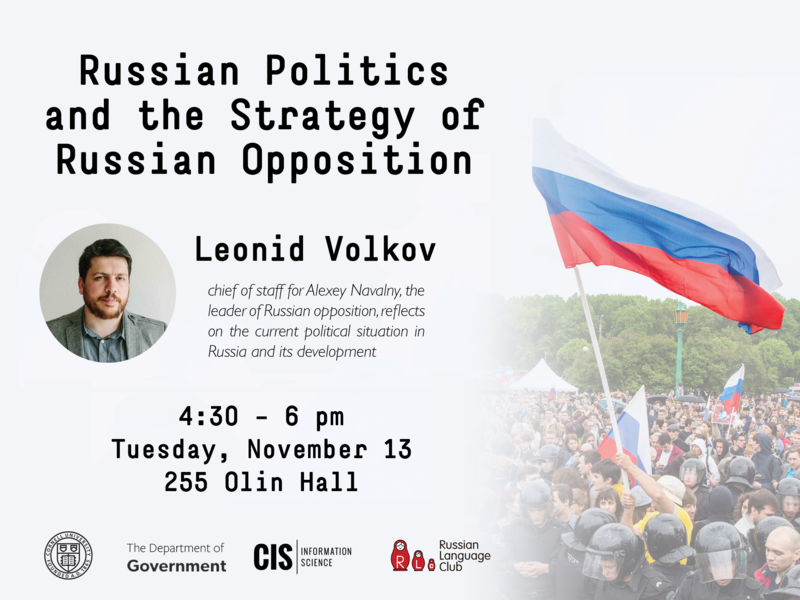 Volkov will then give a lecture – cosponsored by the departments of Government and Information Science, and the Cornell Russian Language Club – titled "Russian Politics and the Strategy of Russian Opposition" from 4:30 to 6 p.m. Tuesday, November 13, in Olin Hall, room 255.